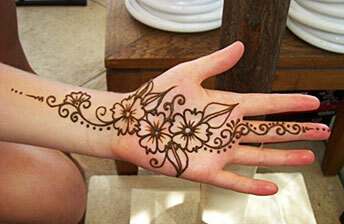 Henna, sometimes referred to as Mehndi, is an ancient art form creating intricate designs on the hands and feet. This temporary body art may last up to a month and retains a hue of deep reddish brown. The typical way to apply Henna would take too long (sometimes up to an hour or more per person) and therefore it is not suitable for most special events. As a result, our tattoo artists create much simpler designs and apply them most typically on the arm, hand, neck or hip. However, for private events, we can provide the artists to create any body art based on the length of time required. If you require this artist to be costumed, there may be an applicable charge.